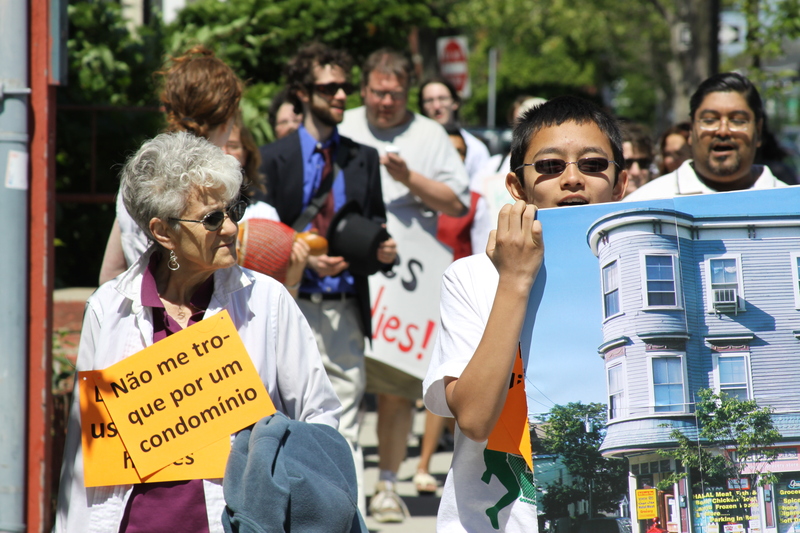 Around 20 members of the Somerville Community Corporation and residents of a section of buildings set to become condos brought signs, chants and a skit to the first Union Square Farmers Market of the season Saturday. “We want our Union Square, not another Davis Square,” the protesters chanted in between market vendors. They also performed a skit in which “movers” attacking a poster of 380 Somerville Ave. with baseball bats. The proposed development, which includes 30 condos and four retail units on top of 378-390 Somerville Ave., will involve gutting a building that houses both residents and two businesses who say they will be priced out of the units that will be built. Malek Bouzahar, who lives at 382 Somerville Ave., said he is unable to work because of a disability and can’t afford to pay more than the $450 a month he is charged now for one room in an apartment he shares with four others. According to a press release sent by the SCC, the owner, Jim Herbert, and his attorney, Richard Di Girolamo, will meet with the residents and business owners this week to discuss the plans. Di Girolamo has previously said Herbert has subsidized those living on the property since he took over ownership of the building, and that he has a right to sell the property. A Planning Board hearing on the project is scheduled for June 9 at 6 p.m. at the Visiting Nurses Association at 259 Lowell St.